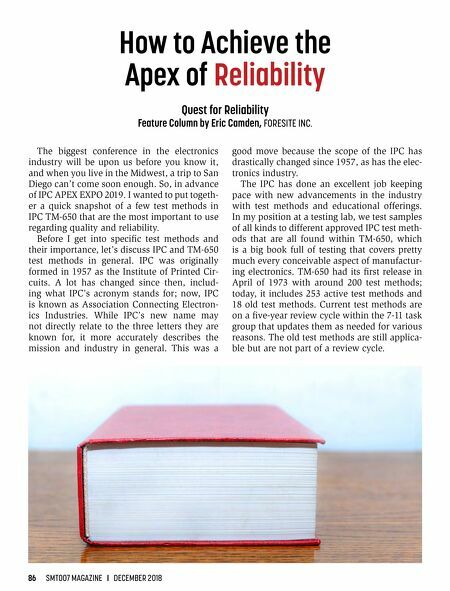 86 SMT007 MAGAZINE I DECEMBER 2018 How to Achieve the Apex of Reliability The biggest conference in the electronics industry will be upon us before you know it, and when you live in the Midwest, a trip to San Diego can't come soon enough. So, in advance of IPC APEX EXPO 2019. I wanted to put togeth- er a quick snapshot of a few test methods in IPC TM-650 that are the most important to use regarding quality and reliability. Before I get into specific test methods and their importance, let's discuss IPC and TM-650 test methods in general. IPC was originally formed in 1957 as the Institute of Printed Cir- cuits. A lot has changed since then, includ- ing what IPC's acronym stands for; now, IPC is known as Association Connecting Electron- ics Industries. 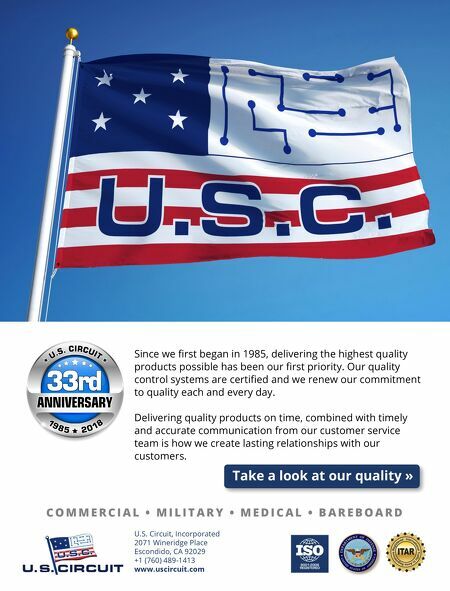 While IPC's new name may not directly relate to the three letters they are known for, it more accurately describes the mission and industry in general. This was a good move because the scope of the IPC has drastically changed since 1957, as has the elec- tronics industry. The IPC has done an excellent job keeping pace with new advancements in the industry with test methods and educational offerings. In my position at a testing lab, we test samples of all kinds to different approved IPC test meth- ods that are all found within TM-650, which is a big book full of testing that covers pretty much every conceivable aspect of manufactur- ing electronics. TM-650 had its first release in April of 1973 with around 200 test methods; today, it includes 253 active test methods and 18 old test methods. Current test methods are on a five-year review cycle within the 7-11 task group that updates them as needed for various reasons. The old test methods are still applica- ble but are not part of a review cycle. Quest for Reliability Feature Column by Eric Camden, FORESITE INC.